This Dodge Hellcat Is Involved In a Furious Police Chase in Houston! - Muscle Cars Zone! This Dodge Hellcat Is Involved In a Furious Police Chase in Houston! Watching a police chase in a movie is something very different from a police car chase in the real world. This means that the danger is omnipresent and no one around the chase is safe. Hereby we decide to take a look at this extremely intense police car chase that goes after a Dodge Hellcat. If you are already familiar with every detail about the Dodge Hellcat, you would already know that this is one of the most powerful cars ever made thus being very fast. Most of us would assume that chasing this extremely fast car would be a problem, and it really is. None of the police cars was able to catch this monster. They chased after him with a helicopter. The highway was a perfect opportunity for the Dodge Hellcat to show its ability. Namely, this ridiculously car has a 6.2L turbocharged V8 engine that is able to make as much as 707 HP. Keeping this in mind, chasing after this American muscle car is extremely difficult. The chase goes on, and finally the Dodge Hellcat makes a stop at the highway and the driver gets out from the car. He starts running across the field but a police officer manages to tackle him down shortly after. It would have probably been better for him to continue driving the car hence running away from a dozens of police officers is something impossible. 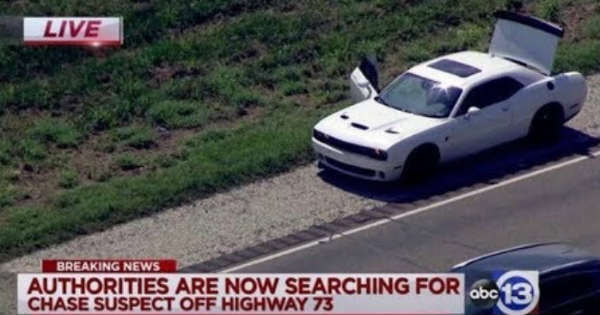 What do you think about this police chase with a Dodge Challenger Hellcat?